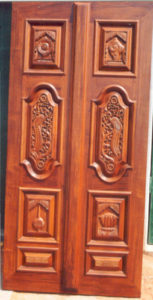 We manufacture this designer entrance door in teak wood single shutter of size 79″ (height) X 36″ (width) and standard thickness of 1½ “. 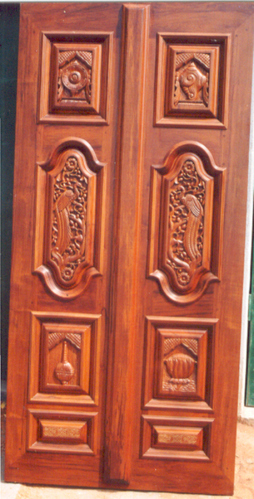 This main door is made with a combination of teak and rosewood having teak wood panel and rosewood stiles. This door is our tribute to the Indian Rupee, which is rising in the International market against all odds. 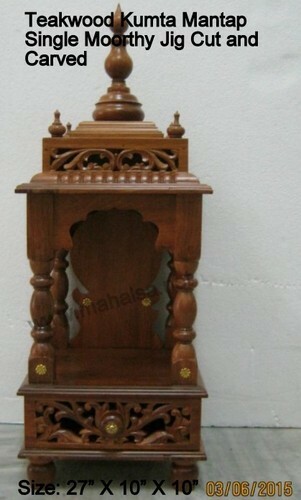 The rosewood stile contains a floral pattern present in the Indian hundred-rupee note. The square panel contains the floral design similar to that on the hundred-rupee note and the long panel contains the side watermark design of the fifty-rupee note. The central rails are molded with plain linear design to highlight the rest of the carving. 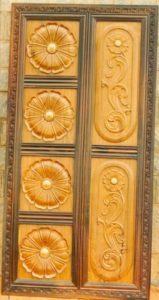 We manufacture floral engraving wooden door in teak wood single shutter of size 79″ (height) X 39″ (width) and standard thickness of 1½ “. 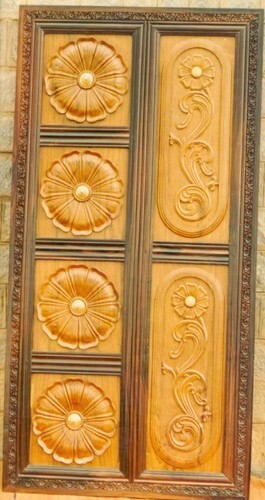 This door is a modern design with minimal carving work. It consists of 15 panels both square and rectangle with only the central panel having light floral engraving. The internal rails are molded and the external stiles contain carving of a creeper on four corners. This door has beautiful beading work on the rear side also. 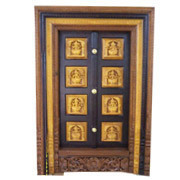 We design carved wooden door in teak wood single shutter of size 84″ (height) x 42″ (width) and standard thickness of 1½”. 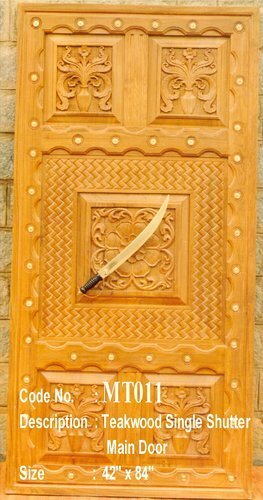 This door is designed around a sword, which acts as a handle to open and close the door. This door consists of flower vases on the top and the bottom panels and a hibiscus flower on the central panel which has the holding the sword super imposed on straw mat motif. 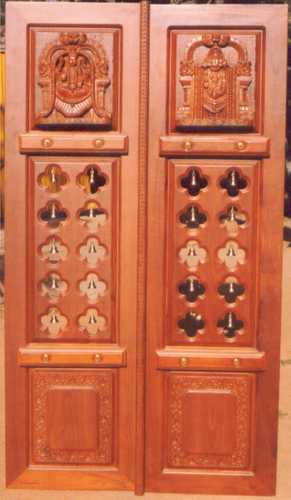 The door is bordered all around with brass studs in ethnic style. This door can be made to order in any size and the designs can be changed to match the requirement of the customer. The finish of the door is in Natural glossy polyurethane coating which provides this door an elegant look. 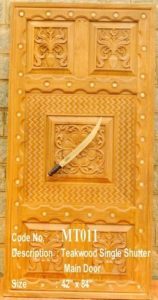 We manufacture this carved wooden door in teak wood single shutter of size 80″ (height) X 36″ (width) and standard thickness of 1½ “. 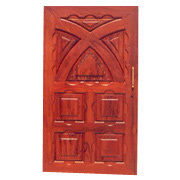 This door is a combination of ethnic and modern design with very less engraving. It consists of eight panels. Foursquare bottom panels with superficial etching and four top panels of uneven size and design, having a bishop cape at the center. The central panel has light floral engraving on the border and the three surrounding panels have similar etching as that of the bottom panel. There are no brass studs and this accentuates the hardware fitted on the door such as decorative handles, knockers, locks & hinges. The padma (lotus) to signify peace and love two panels in his middle show peacocks perched on Kalpa vruksha (tree of prosperity) in the garden of brindavan. This door can be made to order in any size and the designs can be changed to match the requirement of the customer. The finish of the door is in Natural Teak Matt polyurethane coating.